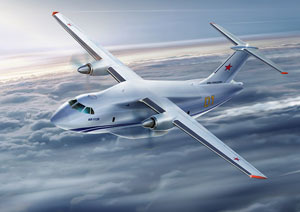 The flight prototype of light military transport aircraft IL-112V successfully passed the first examination for tightness and waterproofness of the fuselage at the VASO manufacturing enterprise (PJSC “Voronezh Joint-Stock Aviation Community”, part of the Transport Aviation Division of PJSC UAC). At the present time, the installation work in the pilot's cockpit and the delivery of all major blocks of navigation and other experimental equipment is being completed. Full-scale work on its development will begin next week. “The performed works confirm one of the most important parameters of aircraft’s vitality — its ability to withstand design loads, what is extremely important for the aircraft, which was created from zero. We know the needs of Russian security structures in such machines, eliminate the issues that arise during the execution of the design work. The implementation of the next stage of the creation of an advanced light transport aircraft IL-112V allows us to expect that the aircraft will rise into the sky by the end of this year. Soon after that we will be ready to start production that quantity of IL-112V, which will be necessary to strengthen the defense capacity of our country”, — said Alexey Rogozin, General Director of PJSC “Ilyushin Aviation Complex”, Vice President of the Transport division of PJSC UAC. These tests are carried out according to a certain procedure, including the technological supercharging in the conditions of the production department and the pressing round outside the department. The final stage of leak test will take place after the complete assembly, installation of all equipment and the first flight of the aircraft. The light military transport aircraft IL-112V is designed for transportation and assault landing up to 5 tons of light-weight armament and military machines, cargo and crew, as well as wide range of a wide range of cargo during commercial application of the aircraft. The aircraft ensures automatic landing approach feature at airfields that are specified in at least II ICAO airfield category and manual landing approach at airfields with minimum radio technical equipment. In the long term the IL-112 aircraft will replace not only the AN-26, but will also compete with world-class transport aircraft of this class.